Guest post by Pinar Gurel. GSA is currently accepting proposals from students and postdocs for the next round of Career Development Symposia. Gain leadership experience and serve the early career scientist community! Among the many roles that scientists play, mentoring younger scientists is one that researchers are rarely trained for. In the current STEM research environment, lack of funding is but one of the systemic issues young scientists face, and their roles, responsibilities, and career trajectories are changing. To address such issues, organizations such as Future of Research and Rescuing Biomedical Research have been formed, while others, such as the National Mentoring Research Network, have arisen to address the training needs of those who wish to remain in academia but receive no formal training in how to mentor students. Still, academia does not always embrace the value of being an inspiring leader, promoting a positive work environment, and having happy, mentally fit employees. Where other industries recognize these benefits, academic culture lags. Conference attendees listen to a panel discussion on mentoring. Panel (L to R): Andy De Los Reyes (UMD), Belinda Huang (GWU), Chinonye “Chi-Chi” Nnakwe (AAAS), Meg Bentley (AU). All of these issues are intertwined, and lead to the career-related pessimism and learned helplessness found in many young researchers around the world. With funding in part from the GSA Career Development Symposia Program, the Ethical and Inspiring Mentorship in STEM conference was held at the University of Maryland- College Park on September 21, 2017 to address issues in mentorship and to discuss current mentorship practices and the ways they could be improved. This one-day conference was co-organized by Juan Pablo Ruiz (Labmosphere), Gary McDowell (Future of Research), Blessing Enekwe (University of Maryland-College Park), and Pinar Gurel (Rockefeller University) with funding from the GSA, ASCB, The Union of Concerned Scientists, BD Biosciences, and the University of Maryland. 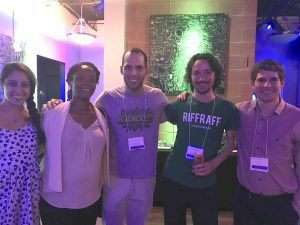 The meeting consisted of three speakers with break-out sessions in between the talks, as well as a mentorship panel, followed by discussion and a networking reception. The entire day was interactive and fostered communication and discussion—both for those in attendance and online through social media (#STEMentoring17). 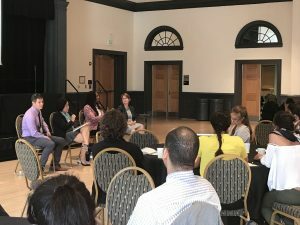 The conversations included students, postdocs, and experts in both STEM fields and mentoring, covering culturally aware mentoring, hyper-competition, mental health, ethical behavior, and advocacy. The meeting began with a keynote lecture by Sandra Quinn (UMD, NMRN) who presented extensive research about current mentoring issues and provided tips for improving mentoring relationships. Importantly, Quinn stressed that anytime one has a conversation with a mentor or mentee, the conversation should start with respect, and this will allow both mentor and mentee to begin discussions in a positive manner. She also addressed culturally aware mentoring and explained that mentors need to be aware that each individual’s life experience is diverse. To be culturally aware and promote diversity, mentors need to demonstrate that they are available and ready to listen. The keynote was followed by breakout sessions with Quinn addressing diversity and being a culturally aware mentor, and Gary McDowell in collaboration with the Union of Concerned Scientists discussing Local Advocacy. Following lunch, Chris Pickett from Rescuing Biomedical Research presented data on the current ailments of the US biomedical research enterprise. Notably, an alarming figure showed the number of trainees is at an all-time high, but the number of tenure-track positions and grant funding for these trainees is at an all-time low. Pickett is working in several ways to reverse this trend and stresses that much more active work is needed. Pickett highlighted the need to raise awareness of all career paths for science PhDs and the need to train academic mentors to enable students to pursue different careers. 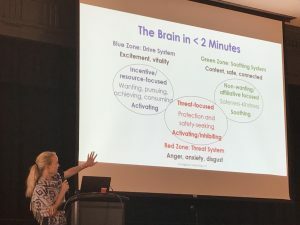 Brooke Deterline (Courageous Leadership, LLC) explains how the brain functions under different circumstances and how anxiety compromises our creativity and productivity. Following Pickett, Brooke Deterline from Courageous Leadership, LLC presented an inspiring talk on leadership in today’s society. Deterline has worked with countless executives and teams to act with ethical courage and ingenuity to overcome complex and challenging issues. During her session, Deterline laid out a paradox common for most researchers: the more we care about something, the more we stress about it. But excess stress often leads to diminished capacity and poor decision making. She noted that “Under time and cost pressure, the ethical implications of our actions fade from our minds.” Deterline encouraged attendees to take on a courageous mindset by focusing on long-term goals and to behave in ways that are in alignment with ones’ values. 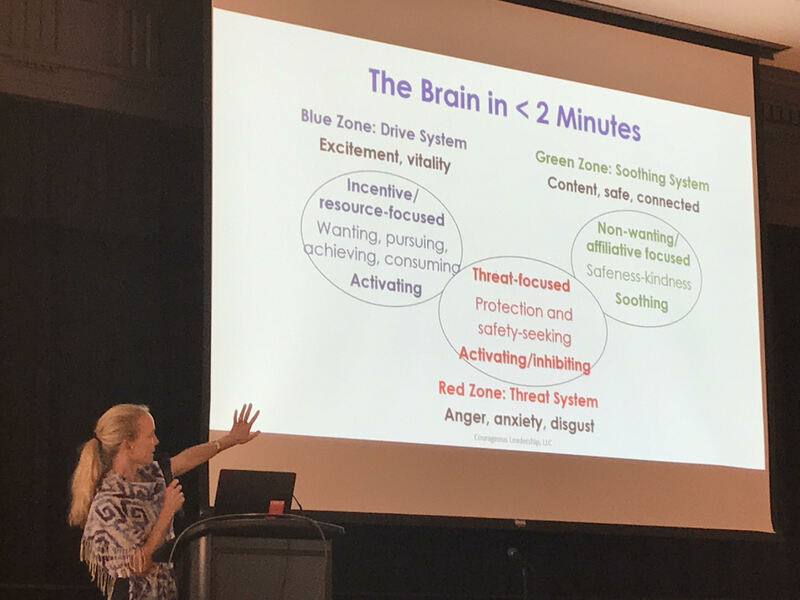 Importantly, she emphasized that how we respond to stress is up to us, and by targeting the negative behaviors resulting from stress, we can behave much more productively. Two more breakout sessions followed, one with Will Olds from Proteintech discussing mentorship across the academia/industry divide, and another with Juan Pablo Ruiz discussing mental health issues and the value of support networks. Ruiz introduced active listening techniques as an effective mechanism to communicate with mentors and mentees—focusing on listening first, and giving advice when needed or asked. The symposium was wrapped up by a delightful mentoring panel featuring Meg Bentley (American University), Andy De Los Reyes (University of Maryland), Belinda Huang (George Washington University), and Chinonye “Chi-Chi” Nnakwe (AAAS). The panelists provided tips and stories about mentoring situations they’ve encountered and recommendations on how to train mentors, how to overcome adversity, and how to incentivize/reward mentorship in STEM. Notably, all panelists encouraged attendees to first determine what they desire in a mentor, and then to seek out many mentors who can contribute to all the aspects of their needs. There is more than one good mentor! Conference organizers and participants unwind at the networking reception at Milkboy Arthouse. From L to R: Pinar Gurel (Rockefeller University), Blessing Enekwe (UMD), Juan Pablo Ruiz (Labmosphere), Gary McDowell (Future of Research), Will Olds (Proteintech). At the end of the day, attendees, speakers, and panelists were all able to unwind and engage in productive discussion at a networking reception at Milkboy Arthouse at UMD. Importantly, this meeting was a step in beginning conversations around the problems and solutions for ethical and inspiring mentorship. One major takeaway from the meeting is that mentorship goes both ways; as a mentee, you have to decide what is the right fit for you and to seek out many mentors. As a mentor, it is important to listen and be aware of what tools and resources your mentee may need.